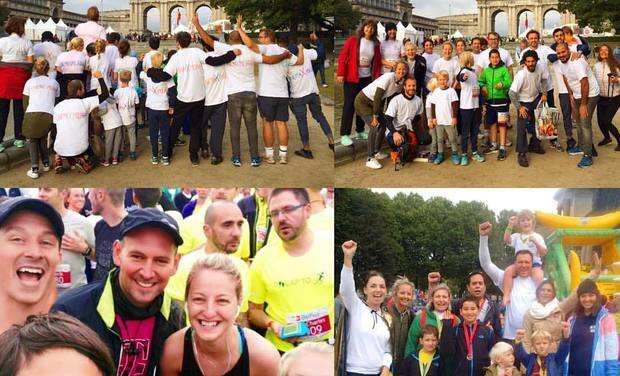 Together with my friends, I ran the Brussels (half)marathon on 2 October 2016 to raise funds for Cinemaximiliaan! 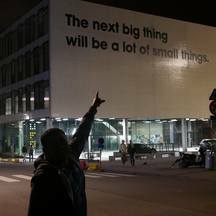 Cinemaximiliaan is a pop-up cinema for and with people on the move in Belgium which started in September 2015 at Park Maximiliaan Brussels (see video: https://vimeo.com/172601395). For those who do not know, the park was located close to Gare du Nord, just in front of the Belgian Immigration Office where newcomers need to register upon their arrival. Last year, the immigration office saw a significant increase in applications, with people setting up tents outside and queuing day and night for several months. This is when the initiators of Cinemaximiliaan thought of offering a daily “living room” where people could gather, watch movies, charge their phones, discuss and meet each other... One year later, Cinemaximiliaan has become a vast group of volunteers, mainly filmmakers, artists and cinema buffs, including many newcomers. They’re now showing movies in many remote asylum centers and refugee camps throughout the country. Many other activities came out of the pop-up cinema, such as cultural trips, film projections in real cinemas, music and dance events, exhibitions, masterclasses and workshops, bringing joy at a time when cultural exchange and kindness are needed so much. It helps both newcomers and locals to get to know more about each other's cultures and backgrounds, an essential ingredient for successful integration. Meanwhile Cinemaximiliaan has been in close contact with hundreds of newcomers, who are working hard to build up a new life in Belgium. Some are still waiting for their papers, some are living in asylum centers, others are thankful to have done a first step into a new community. In these precarious conditions, Cinemaximiliaan receives many questions from newcomers who either have a strong entrepreneurial drive, and excellent skills and passion to pursue it, or they see this as a necessity for their financial stability - whichever the circumstances, we have met wonderful newcomers who have great artistic skills, such as video production, music, painting, photography and also professional competences in shoemaking, webdesign, psychological assistance, hairdressing, journalism and so many more. You can find pictures on Cinemaximilaan's Facebook page https://www.facebook.com/cinemaximiliaan/photos and if you are in Brussels and would like to take part in their activities, make sure you join the group https://www.facebook.com/groups/1492478677713388/. ***** The (crowd)funds raised by this campaign will be used to support individual newcomers in setting up their project or professional practice. Sometimes little things can make a big difference: a camera for a filmmaker or a photographer, a musical instrument for a musician, a basic tool set for a shoemaker or a hairdresser, a computer for a web-designer… Everybody has his or her own skills and to be able to deploy them brings confidence and empowerment, improving the vulnerable condition of newcomers in this country. Thank you again for your contribution! -	a big thank you &	a cup of coffee/ tea/ hot chocolate, ice cold lemonade on me next time we see each other!